In 2015, the Städel Museum received the Grimme Online Award for its “Digitorial” for the exhibition “Monet and the Birth of Impressionism.” Chantal Eschenfelder, director of the Städel Museum’s department of education and communication, discusses record numbers of visitors, digital education and art mediation in the 21st century. Frau Eschenfelder, the Städel Museum’s innovative offering in preparation for the Frankfurt Monet exhibition drew more visitors to the museum than any other previous exhibition. Is this record number of visitors due solely to your new digital format? Not at all, that wasn’t our goal, either. With our digital mediation services, we have created an entirely independent area to complement the analogue museum operations. Our Digitorial, which is free of charge, instead assists visitors to prime themselves in terms of content for the respective exhibition theme, and thus to enrich the museum experience. In particular in the case of heavily-attended exhibitions, visits to the museum can be planned better because one knows in advance which works one absolutely wants to see, instead of having to read the wall texts in the midst of a scrum of other visitors. What target audience does it address? During the Monet exhibition, about 50 percent of the 432.121 visitors made use of the opportunity to inform themselves beforehand. This is an enormous increase in outreach range compared with other mediation formats such as audio guides or accompanying exhibition booklets, which as a rule were used by only five to 20 percent of our visitors. Statistically, with about twenty percent respectively, the page views distributes relatively evenly across all age groups. Only the youngest group of 18- to 24-year olds is somewhat less represented. And: in comparison to the classical exhibition visit, somewhat more men make use of the Digitorial. Städel has also developed additional innovative offerings, such as “Kunstgeschichte Online. Der Städel Kurs zur Moderne” (i.e. 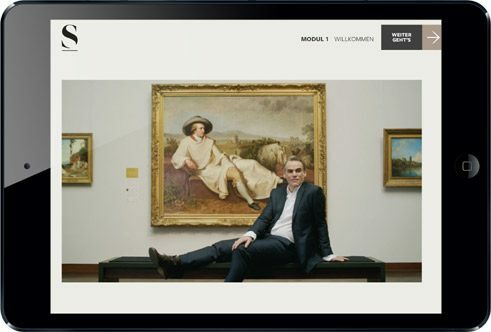 art history online: the Städel course on modern art). What is in this programme and how is it being received? The online course is based on 250 works from our collection, and provides an art history programme with five sequential modules. However, they do not follow an historical chronology, but instead focus on core themes: from image analysis to formative contexts, systems of artistic classification and finally the history of collecting and exhibiting. In an interactive and multi-medial fashion, the user learns more about the various conditions for the creation of a work, how and why artists and artists’ groups have joined together, or for instance how the emergence of museums has influenced artistic creation. The course is free of charge and is very well received: in six weeks since the launch on 16 March 2016, over 9.000 people have used and 200 have completed it. have already completed it. In addition to films on various core themes, it also contains game-based learning formats, in-depth texts as well as an interactive timeline that illustrates the historical categorisation of events, artists, art movements and key works. Actor Sebastian Blomberg guides the user through the course. Sound design by Berlin musicians Boyz Noise. Sponsored by the Städelsche Museums-Verein and the Christa Verhein-Stiftung. What type of art mediation does the online course aim for? Our new digital offering, which incidentally was developed jointly with the Institute for Philosophy and Theory of Art and the Centre for Digital Cultures of Leuphana University Lüneburg, is interesting for those who wish to upgrade their education in a diversified way in art history and visual studies. The course does not only communicate historical facts, but also gives course participants an opportunity to acquire an independent and critical approach with works from modern art. Our goal was to develop contemporary learning formats that correspond both to the increasing fragmentation of knowledge as well as to users’ information needs and learning behaviour: in their own tempo, multi-medial and with game-based task elements – in short, a continuing-education option that makes full use of the potentials of digital art mediation. What master plan and what strategy is the Städel pursuing with its digital offensive in the 21st century? In 2012, following the structural expansion of our building with the Garden Halls for Contemporary Art, we felt that the next logical step was to communicate our contents beyond the physical boundaries of or museum as well. The Digitorial and the online course are part and parcel of an overall strategy that also comprises a computer game for children, the Städel App, the Digital Collection, a film programme and many other measures. Since increasing numbers of people derive their information exclusively from the Internet, it is important to be present with cultural contents in digital space as well. We wish to harness the new technological potentials for the museum’s core tasks. Art mediation must be tailored to users’ individual needs in digital space as well. In this way, totally innovative digital experiences, personalised, multi-medial and interactive, are emerging. Is your audience altering its viewing habits through digitalisation – is the trend moving towards a highlight show? Quite the opposite! In our Digital Collection, for example, works are spotlighted that are accessed not only via the name of a celebrated artist, but because they are appealing in terms of motif and aesthetics or offer interesting background information. But that depends concretely on the quality of the mediation offerings. For this reason, we as a cultural institution do not wish to leave the field of digital education to commercial providers alone, but instead take our educational mission seriously and thereby make our contribution to preserving our cultural heritage. Ulrike Prinz conducted the interview. She is a cultural scientist, freelance author and editor.